Members of the Zonta e-Club of Canada1 have many community partners and work on numerous local projects. 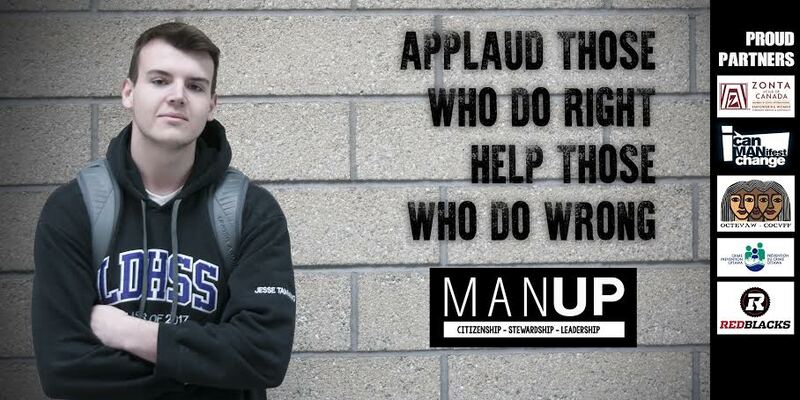 One of our major advocacy projects is collaborating with ManUp. 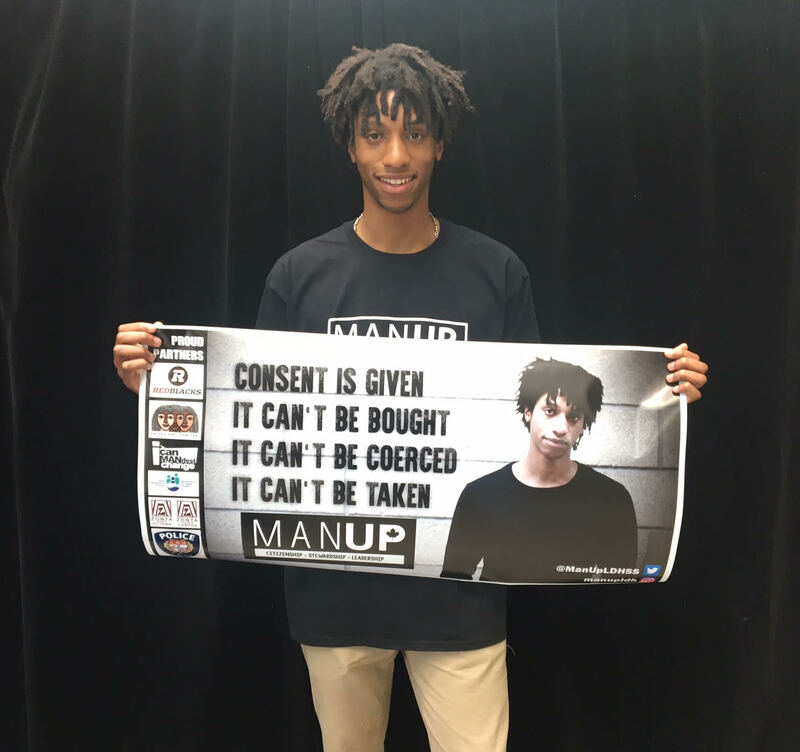 ManUp is a group of male high school students in Ottawa who are determined to prevent and/or reduce violence against the women and girls in their community. Their approach to preventing violence against women (VAW) or gender-based violence (GBV) isn’t typical but from what we’ve seen, it’s powerful (check out their blog). On May 11, 2017, I was invited to speak to a group of about 220 young men who are participants, future participants, and leaders of ManUp. Specifically, I was asked to explain how ManUp, the Ottawa Coalition to End Violence against Women (OCTEVAW), the Ottawa RedBlacks, and the Zonta eClub of Canada formed a partnership. What follows are the remarks I shared that day. This short address helps to explain part of what motivates the Zonta eClub of Canada. I want to start with a quick story. A true story. On May 12, 1982, MP Margaret Mitchell rose during question period and told Parliament that “one in 10 Canadian husbands beat their wives regularly.” What do you think happened next? Well, she got no further because of an outbreak of laughter and heckling that drowned her out. Yes, the other MPs laughed at her. Scarcely 35 years ago it was a different world. It’s barely a generation ago but there were no women’s shelters, no place for a woman to go with her kids if she needed a safe space. No place for a mom, a sister, or a cousin to find safety. It seems shocking now. I’m sharing this story because we’ve come so far. Today I’m going to talk to you for a few minutes about how ManUp is partnering with other organizations from the broader community … and to explain part of our combined vision. First off, we all want men and boys to see themselves as leaders and agents of change and also as empowered bystanders who can help put a stop to VAW & GBV through their own actions. I’ll start with a bit of context. Our eClub has male and female members. Most of our meetings happen online. People participate by video or audio. Our online format and modern approach are appealing and we’re growing quickly. Two years ago, I reached out to the Ottawa Sports and Entertainment Group (OSEG) about partnering with Zonta to raise awareness about VAW. I got the idea from the Zonta Club of Toronto’s efforts with the Toronto Argonauts. 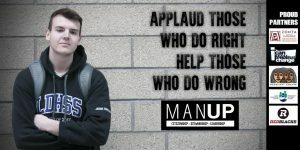 Through Mark Sluban, I was introduced to ManUp and got to know about OCTEVAW. I thought the idea of ManUp was important and timely so I brought it back to my local club and we made some initial donations to the program. I’m glad to see that the Zonta Club of Ottawa is still maintaining those efforts by helping to support the ManUp Inspire Conference. 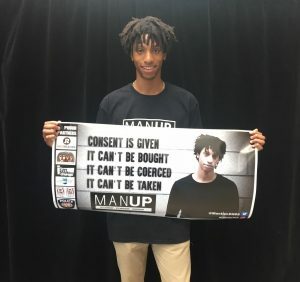 A small group of us felt that we could promote ManUp even further by strengthening this partnership between ManUp, the RedBlacks, OCTEVAW, and the Zonta eClub of Canada (a club with a different approach and broader reach than our traditional local club had). Our eClub consists of membership primarily in Ontario but it is expanding across Canada which will bring even more power to the Zonta contribution. Zonta eClub members are all business people and professionals with vast networks and influence. And we believe that this initiative that you have started here is a powerful tool in the fight against VAW/GBV. We share the ManUp story in networks that are hard to reach otherwise. For instance, when the eClub reached out to federal and municipal government leaders to request that certain landmarks are lit up in orange to mark Nov 25th, the UN’s International Day to end VAW (ZI & UN have a long-standing relationship) – we included ManUp and OCTEVAW. So far, the 3D Toronto sign will be lit. We’re still waiting on answers from Niagara Falls, Queens Park, and various City Halls, and our brand new 3D Ottawa sign in the ByWard Market. We’ve put ManUp on the radar of the federal Minister for the Status of Women because of our letter to request lighting up the Parliament Buildings. The federal government recently announced $100 million in funding for a national strategy around VAW/GBV so this is an important symbolic early step. Our members are women and some men who are business owners and professionals. With our national reach and deeper connections to business owners across the country, we know that much more is possible. For starters, we’re planning to launch a national newsletter. We’ll share information and events that relate to VAW/GBV and other matters that are consistent with our eClub’s vision and mission. It’s a good way to promote events, attract new members, and possibly even solicit donations. We’re definitely committed to expanding ManUp’s reach and amplifying their voice. One of our key contributions is fundraising. Our success at fundraising will be enhanced by accessing your networks – your parents, friends, neighbours – and this will ultimately benefit ManUp. We’ll continue to work with Travis Wing who will share information about how you can help us get the word out about fundraising events. Ultimately, when we work together we are stronger. This article was written by Dr. Helen Ofosu and the views expressed don’t necessarily reflect the opinions of other members of the Zonta e-Club of Canada1 or Zonta International. She is a founding member of the Zonta eClub of Canada1’s Board of Directors. Posted in Blog, Gender Equality and tagged Advocacy, Gender-Based Violence (GBV), ManUp, Violence Against Women (VAW).